A great-grandmother has thanked a group of teenagers for saving her life after she fell in the road. Vera Brinded, 89, fell into the path of oncoming traffic in Worthing Road, East Preston at around 7.50pm on Easter Sunday, outside her retirement flat in Milliers Court. A group of teenagers helped her onto her feet and out of danger – but she never had the chance to thank them. She added: “All you hear are negative things about young people. They could have looked at me and kept riding past, but they didn’t – they put their bikes down and the girl ran over, followed by the boys, and they helped me up, because you are a dead weight when you are lying there. “I hope their parents might read this too so they realise what they did for me; every parent should know about their children’s good deeds. The retired receptionist had been taken home by car after spending the afternoon with her friend when she slipped off the kerb, missed her footing and landed on her back in the middle of the road, unable to get up. After the teenagers responded to her cries for help, a nurse from Wick who was driving to work pulled over and got out to help. 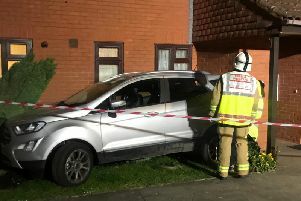 She called for an ambulance and accompanied Mrs Brinded back to Milliers Court, where she stayed with her for three hours while she was treated by paramedics and taken back to her flat by wheelchair. Her back is badly bruised, but Mrs Brinded said ‘it could have been a lot worse’.